As the most concentrated amino acid in your body, L-glutamine -- also known as glutamine -- is involved in more metabolic processes than any other amino acid. Because it fuels white blood cells and other rapidly dividing body cells, glutamine is indispensable to immune system function and tissue repair. While your body normally makes all the glutamine it needs, a serious injury or prolonged illness may require you to increase your dietary intake, which generally means eating protein-rich foods. Meat, poultry, fish and seafood are among the best sources of glutamine. Although they all contain ample amounts of protein, foods that supply higher levels of protein tend to be higher in glutamine. This generally means you’ll get more glutamine from a lean cut of beef than you will from a fatty one, simply because a lean cut of beef supplies more protein per ounce than a portion that contains higher amounts of fat. That doesn’t mean, however, that fatty fish like salmon aren’t excellent sources as well. Many dairy products are rich in glutamine. Whey protein, a byproduct of cheese production that’s used as a nutritional supplement, is a top source of glutamine. While milk and yogurt are good sources of the amino acid, cheese is generally a better source. 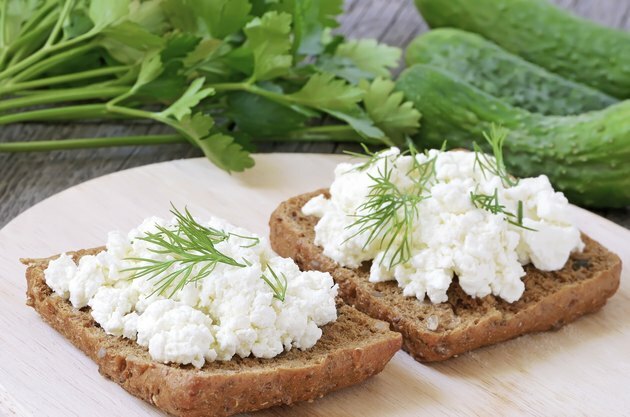 Cottage cheese and ricotta are particularly glutamine-rich, but you’ll also get substantial amounts from Parmesan cheese, mozzarella and cheddar. Like other animal sources, milk, yogurt and cheese that are lower in fat typically supply slightly more protein and glutamine per ounce than high-fat dairy products do. You don’t have to consume animal products to get glutamine from your diet as it’s found in plant-based foods, too. Dried lentils, peas and beans -- especially soybeans -- are good sources of glutamine because they’re rich in high-quality protein. Cabbage is another good source. According to the “Encyclopedia of Healing Foods,” by Michael Murray, N.D., the anti-ulcer effects of cabbage have been largely attributed to its glutamine content. Other vegetable sources include raw spinach and kale, parsley, fresh beans, beets, carrots and Brussels sprouts. Eggs are another major source of glutamine. There’s plenty in egg whites, too, if you’re watching your cholesterol intake. Many whole grains are rich in glutamine, including oats, wheat germ and products made from whole wheat, quinoa, millet and brown rice. Despite their high fat content, nuts, seeds and their butters -- particularly those that are higher in protein -- contain significant amounts of glutamine. Almonds, pistachios, walnuts, pumpkin seeds, sunflower seeds, peanuts and peanut butter are all good sources. The average diet supplies anywhere between 1 and 6 grams of glutamine a day, according to NYU Langone Medical Center. There are no intake guidelines for glutamine, however, because the vast majority of people consume diets that allow their bodies to make what they need. While glutamine supplements are often used to boost recovery after surgery, critical illness or traumatic injury, they’re also sometimes recommended for endurance athletes and cancer patients. As with all nutritional supplements, glutamine supplements should only be taken as directed by a physician.